Congratulations to the winners of the 2013 Poetry in Motion® Contest sponsored by Metro Arts in Transit and the Poetry Society of America. Eleven poems were selected for publication and will be displayed on MetroLink trains and MetroBus vehicles for up to one year. Linda O’Connell’s winning poem is titled “Bygones.” She is also from St. Louis. Heather Elizabeth Lynn Adams Farrar’s winning poem is titled “Let a ‘Word’ Be:” She is from St. Charles, Missouri. “Congratulations to the winning poets. They come from diverse areas all around the St. Louis region,” said David Allen, Metro Arts in Transit Director. The authors all live within a 50-mile radius of the City of St. Louis. The contest was open to poets of all ages. A panel of literary professionals from the St. Louis region judged the 115 entries. 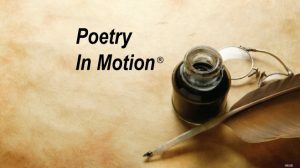 The Poetry in Motion® winners have been invited to read their poems at a special ceremony on November 29, 2012 at the Regional Arts Commission. Each winner will receive a $50 award. The winning poems will be published at a future date on the Arts in Transit website. The Metro Arts in Transit program has sponsored various poetry and literacy contests over the past two decades. The 2013 Poetry in Motion® contest receives financial support from the Regional Arts Commission and the Missouri Arts Council.